Finding a qualified fence company can be difficult. Determining the type of fence that is best for your property, and choosing from the variety materials and styles that are available, is even tougher. Therefore, it is vital for homeowners to know how to go about finding a fence company they can trust and one that can get the job done according to their needs and budget. Before selecting a fence company, you’ll first need to have an idea about which material will be used to build your fence. Some companies specialize in certain product lines, so it’s often helpful to direct your search according to your primary preference. Wood, vinyl, and aluminum have become the most popular materials used in the fencing industry because of their low prices and ease of installation. In addition, you’ll also want to consider the style (picket, privacy, semi-privacy), the height (3ft, 4ft, 5ft, 6ft, or higher), and other accessories like gates and post caps. It’s always a good idea to look into and get quotes/estimates from at least two or three different fencing contractors before weighing the pros and cons of each company. Remember that choosing the least expensive contractor isn’t always the best option. Price does not indicate the level of experience, reliability, skill, honesty, or stability that a quality fence contractor should have. Price only measures the cost of the job. So be sure to consider at least one other factor in making your choice aside from the amount you’ll have to spend. One of the easiest ways to find a quality fencing company is to ask your neighbors and friends. Many times they can give you recommendations on competent companies as well as ones to avoid. Here are a few of the most important questions to ask a prospective fence company. It also may be a good idea to print this page for future reference. The questions below will provide information that is vital if you are considering a new fence or repairing an existing one. This is the expanded edition that essentially gives you background information on each question and lets you know why each question is important. You may want to print this for reference later. 1. How long has your company been in business under its current name? When you’re getting into the process of hiring a fence contractor, you’ll want to dig deep to get an idea of the potential contractor’s business history. First, do an internet search for their company, then the owner by name, and finally any employees you know of. Look for anything suspicious or undesirable and eliminate those companies immediately. Next, carefully consider consumer reviews of qualified businesses. There are plenty of local review sites that have reliable information like USFenceGuide.com and AngiesList.com. Ideally, you are going to want a fence company with a positive track record and a professional history of at least 5 years, unless you know the contractor personally. 2. Where are you located, and do you have conventional office space? Does the potential fence contractor have an actual office? Storefront business space typically indicates a company’s size and focus. Ideally you’re going to want to find a company that is not too big and not too small; that can accommodate residential as well as commercial clients. Check to see how competent and supportive the staff is: employees of highly-qualified and experienced companies should be able to answer a variety of questions with ease and authority, addressing your needs and concerns without talking over your head or referring you immediately to someone else. Although smaller businesses typically provide a higher level of personalized service, larger ones often have economies of scale in place and may be able to offer a lower price. You will need to weigh your needs and interests as a client to decide which option is best for you and your project. 3. Is your company licensed to operate in this state? Payments to a business, as opposed to an individual, will usually provide some assurance that you’re on the books somewhere, so you can protect yourself from disputes or duplicate charges. Making payments to an individual, however, introduces a set of potentially serious circumstances. If the contractor has a business license, for example, but still asks you for an individual check, he or she may not be reporting that income for taxes– not exactly a sign of an honest company. Allowing someone who is unlicensed to begin or complete a job essentially puts you at risk: you would be responsible not only for any shoddy work, but worse, for any accident or injuries sustained by workers on your property. Furthermore, you should never agree to pay in cash, which is often requested by questionable and unscrupulous contractors because it is impossible to track. Checks and credit cards are typically the safest options for you as a consumer. To make sure they are licensed, check here. 4. Does your company carry insurance, including liability and workman’s compensation? Make sure your contractor carries both general liability and workman’s compensation insurance. General liability insurance protects your property from damage caused by the contractor and/or the company employees. The contractor’s insurance company should pay for the cost of any damage that occurs in the course of the job. Workers’ compensation insurance protects you from liability if a worker is injured while on your property. Request documentation of a company’s insurance coverage, ensure the policies are up-to-date, and make copies before signing a contract or allowing any work on the project to begin. 5. Is there any pending legal action against your company? Our first question mentioned checking the history of each company. This question is needed to reiterate that point. Make sure that a thorough background check is completed to verify there is no pending legal action against your contractor. What if the legal action forces him to prematurely discontinue the fence construction? You’ll have to either finish the job yourself or start all over again with a new company. A handy guide for verifying any pending legal action can be found here. 6. Does your company pull permits? While it’s important to ask the contractor about the permitting process, it’s also a good idea to verify which local permits you will actually need for the job. Most cities and counties have online resources which identify what is required of homeowners before, during, and after renovation or construction projects. Use those guides to double check the advice of a prospective contractor, or call the permit office to inquire about the necessary fees and procedures. Another important reason to clarify your city’s or county’s policies is that your homeowner’s insurance may refuse to cover accidental damage if you did not secure the appropriate permits beforehand. You may even want to consult with your insurance agent about the terms of your coverage and what permits are required, should a claim be necessary. 7. Will you contact my utility company to verify the location of buried lines? Fence contractors should always contact your local utility companies to locate and mark underground gas, water and power lines. The service is typically free, as it is provided directly by utility providers. Good contractors will also request a copy of your survey records to verify exactly where your property lines are. If you do not have one on hand, they should be able to refer you to a surveyor and/or title company who can produce one for you. Any homeowner hoping to build a structure such as a fence or deck should always be sure that his or her plans do not encroach upon public right-of-way or a neighboring property. Both surveyors and utility companies can provide invaluable information which will not only protect your property, but will also cover any contractor’s liability. Update: You can also call a service Call811.com. 8. When is payment required? Do you require a deposit? Although policies differ from contractor to contractor, ideally he or she will accept payment-in-full AFTER the job (and any follow-up inspection) is completed. Some contractors may require a deposit of a certain percentage (up to 10%), and some may even negotiate a payment schedule. The most important rule-of-thumb is two-fold: first, make sure that you are clear on the payment terms before work begins, and second, make sure that you are satisfied with the job before rendering the final payment. There have been reports recently of a few fence contractor scams that involve paying money up-front. Your goal as a consumer is to hold onto as much of your money as possible for as long as possible. Keep this in mind during your fence contractor selection process. 9. Will you provide a firm written contract? A written agreement ultimately protects both you as a homeowner and your contractor as a working professional. Most contractors will offer a formal estimate which breaks down a series of fees and potential costs. This should include separate totals for basic materials and labor, as well standard charges for any additional materials or services which may be necessary in order to complete the job safely and thoroughly once work begins. An itemized estimate or bill of service is also helpful to any homeowner seeking a fair measure of comparison between competing contractors. (Note: Labor fees for fence installation or repair should generally be calculated for the job as a whole, not at an hourly rate of service.) Be sure to stipulate when the job will start, when it will end, and when all payments, deposits or balances are due, as well as to whom they should be rendered. Typically, all of the details of the project should be spelled out in careful terms. A good contractor should also not be afraid to offer you a choice of two proposals which outline the costs of using different brands or materials. Make sure that you read and understand the entire proposal, and don’t be afraid to ask for clarification. You should never sign a contractor’s proposal form until you’re satisfied with all the terms. Keep your copy of the contract and/or invoice, and maintain diligent personal records (including date, amount, check number, and mode of delivery) of all payments to the contractor throughout the course of the job. 10. Do you provide references from satisfied customers? Most good fence contractors present references as part of their proposal or professional portfolio. The very best include pictures of previous installations and contact information for former clients who are willing to testify directly to the quality of their work. Don’t be afraid to ask the contractor to provide either of these resources if they are not readily available. If you haven’t already done so, be sure to follow up by checking ratings and reviews online. 11. Will you use subcontractors for any part of the fence installation process? Some fence companies may sign a contract with you, but will actually hire out other individuals to complete anything from the entire job to particular parts of the work. Remember that while doing so may be less expensive, using employees instead of subcontractors gives both the fence company and the homeowner much more control over the safety, quality, and timeliness of repairs and installations. 12. Are you members of the AFA (American Fence Association)? BBB? BBB Rating? It’s always a good idea to consider hiring a fence contractor with professional and/or corporate affiliations. In most cases, the AFA and BBB attract conscientious fence companies whose owner/operators are committed to improving the industry and protecting consumers by setting themselves apart from opportunists, unlicensed or unknowledgeable contractors. In order to become a member of either group, a company’s background and references are thoroughly checked. Members of the Better Business Bureau should have an A rating or higher. 13. What is your policy for waste removal and cleanup? Find out if installation includes removal of an old or existing fence, as well as how these materials will be disposed of. (Double-check your sanitation company’s policy for curbside pickup to identify anything hazardous or restricted which should be removed by the contractor or taken directly to the landfill.) Ask which parts of your particular job will create the most mess. How will dangerous debris such as stray nails or screws be removed from the yard? Make sure that you specify removal and/or cleanup in your contract, and clarify any additional costs or fees. Although contractors may charge extra for the removal of an existing structure, good fence companies should not charge fees for cleanup following their own installation work. 14. What the width of each fence panel you plan to install? Most fence companies offer either 6-ft or 8-ft wide panels. In many cases, the climate and topography of the region in which you reside dictates the preferred length of your fence panels. 6-ft panels offer higher wind-load resistance and more flexibility in accommodating a natural slope. Remember, however, that while 6-ft panels may be cheaper per piece, they typically cost more to install because they require additional posts, labor, and possibly concrete. 8-ft panels are usually fine to use as long as the materials used in manufacturing are of sound quality. 8-ft panels will cost a bit more than 6-ft panels, but you will need fewer of them, and in general, the overall price of installation should be less. 15. How deep will your company set the posts? Will you use concrete? In most instances, the taller the fence, the deeper the posts will need to be set. The depth and diameter of any post hole depends greatly on the style of fence, the terrain, temperature zones and other variables such as wind load or digging conditions. Most fence companies recommend a standard formula of 1/3 below & 2/3 above. A 6-ft fence, therefore, would have 9-ft posts, 3 feet of which would be buried underground. Concrete should be used whenever a vinyl, aluminum, or chain link fence post is installed. 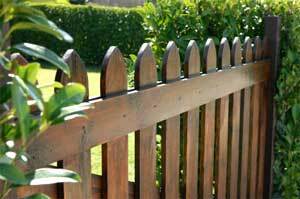 Wooden fence posts, however, are an exception to this rule, as moisture from the concrete can cause rot. 16. How will the slope in my yard be handled (if any)? Pre-assembled fence panels can only be installed on a slope using what is known as the step method. As a result, the rails will remain straight between each post, with the top and bottom of the fence section completely level as each piece “steps” up or down accordingly. Remember that pre-assembled fence panels cannot possibly match the unique features of every landscape. If you choose to use them on property which has a particularly steep slope, your fence will have a gap under each panel, running diagonally between the post with the higher elevation and the post with the lower elevation. In this case, it may be better to purchase loose fence components and hardware so that you’ll have a bit more flexibility with privacy and installation. 17. Will the owner or foreman of the fence company be present during the job? Many larger companies handle several jobs at once and will often only send the owner or foreman out to large, highly-specialized, or high-profile jobs. If you have a small residential job, you may want to hire a small, neighborhood business, where the owner or foreman has adequate time to come out and make sure your job goes smoothly and is completed in a timely manner. Although smaller companies sometimes charge more, they often provide their customers with a more personalized experience. 18. When can you get started and how long will it take? In most cases, this will depend on the company, the size of the job, the time of year and the type of fence being installed. Make sure that a contract stipulates when the job will begin and end before you sign it. 19. How should the fence be maintained when you have finished the job? The maintenance of your fence will depend on the materials used in the construction. Vinyl, aluminum and chain link fences are generally easier to maintain than wood ones are. There are, however, specific things that can be done for each type of fence in order to make it last longer. With a wood fence, for example, staining, painting, applying insecticide and keeping up with mold removal are important ways to enjoy a longer-lasting fence. Vinyl fencing, on the other hand, requires relatively simple upkeep—a little cleaning now and then. Just be sure to ask your contractor what he or she would recommend for your particular fence. 20. What is your installation warranty? Manufacturer’s product warranty? Once again, your warranty will ultimately depend on factors such as the fence material, the manufacturer, and the contractor. Most fence companies offer 2 to 5-year warranties on the actual installation. Manufacturers of vinyl fencing typically offer limited lifetime warranties on their products. Some will even offer transferable warranties that can be reassigned to a new owner if you ever sell your house. Make sure you understand the terms (especially if you need to register your product) and be sure to have all the appropriate warranty information included in your contract. 21. How long is your quote/estimate good for? Most fence companies that give you an estimate often forget to make it time-bound. The good fence contractors, however, know that offering the potential customer an incentive to reach a deal quickly can be a useful business strategy. Many fence contractors should give you as long as 2 or 3 months to decide. Just remember that fence materials can fluctuate in price, so an estimate may expire after a certain time has passed. Most quality fence contractor, with experience, won’t have any problems answering any of these questions and many will even have the information and documentation ready for you during their visit. If you are in the market for a new fence and would like to have multiple contractors compete for your business, please fill out the form below.